The Dorchester’s afternoon tea lived up to expectations, delivering a five-star experience with a true sense of occasion and grandeur. 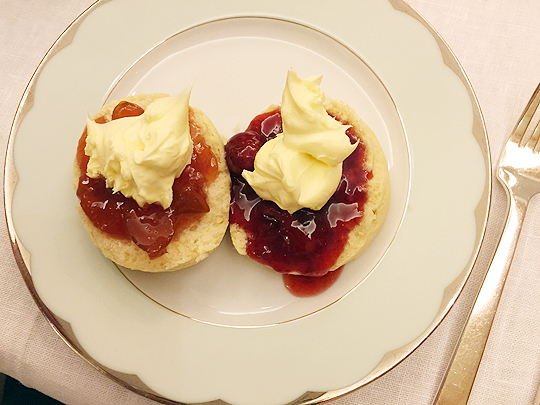 High Tea Society was thrilled to experience high tea at The Dorchester Hotel in Mayfair, one of England’s most esteemed high tea venues. The Dorchester’s high tea lived up to expectations, delivering a five-star experience with a true sense of occasion and grandeur. 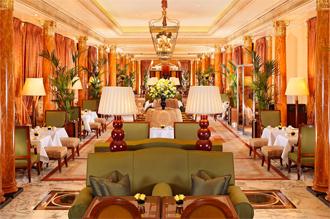 Situated on Park Lane opposite Hyde Park, The Dorchester Hotel is a home-away-from-home for celebrities, members of various royal families and oil-sheikhs when in London. High tea is served in The Promenade, which is an incredible marble-lined room separated into dining spaces by large comfortable couch-style seating, immense fresh floral displays (some of them were bigger than me!) and carefully placed statues, lamps and screens. The whole room is decorated with marble columns and palms and is filled with the sound of classical music and show-tunes coming from the grand piano situated at the rear of the room. Guests for high tea are a mix of tourists, hotel guests and local Londoners celebrating special events like birthdays and anniversaries. The dress code is smart casual (e.g. no ripped jeans or baseball caps) but most people tended to dress up for the occasion. The staff are true professionals who shepherd you through the entire high tea, ensuring a relaxed and relatively seamless experience. We did find there was something of a wait between our tea arriving and the first course, finger sandwiches, arriving. However, the service was otherwise incredibly gracious, kind and well organised. Staff wear either a full suit or tails, depending on their rank and role. And the staff to diners ratio is very high; it seemed our waiter perhaps only looked after four tables of 2 to 3 people each. 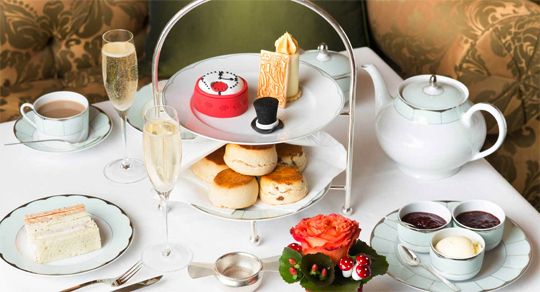 Of course, the tea and food itself are the most important part of the high tea experience and again, The Dorchester proved why it is one of London’s most popular and awarded high tea destinations. The high tea begins with selecting tea from a very extensive tea menu (and/or champagne if you opt for a champagne high tea). 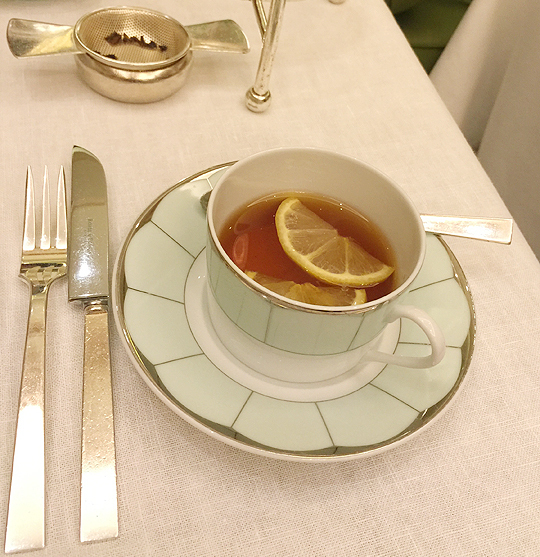 The Dorchester have their own ‘house blend’ – something like English Breakfast – which my dining partner ordered, whereas I opted for a less traditional lemon and ginger herbal tea. Both teas arrived as loose leaf in fine bone china teapots and were poured for us by the staff, who attentively refilled our teacups throughout the two hour high tea. The Dorchester also serves a range of rare and unusual teas, including tea grown in Scotland, which you can order for an additional cost. Tea is followed by the arrival of large silver platters of classic finger sandwiches. There were approximately eight flavours of sandwiches. They ranged from the more traditional cucumber and cream cheese and egg and cress sandwiches, to the slightly more daring cheddar with mango chutney, poached chicken or smoked salmon. The egg sandwiches were particularly delicious, with the filling being really well seasoned and the fluffy white bread and slight crunch from the cress combining perfectly with the creaminess of the egg. A second and third round of sandwiches was offered and, apparently, diners can choose to have as many sandwiches as they like! 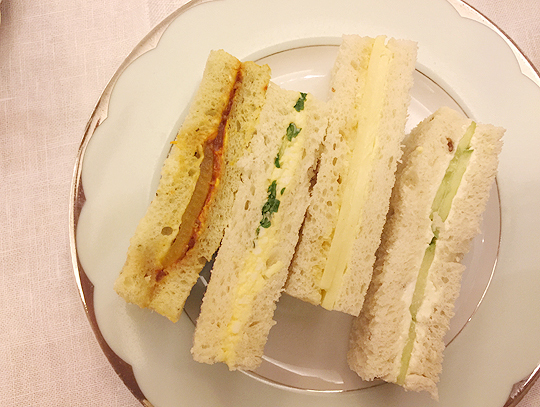 We wisely stopped at two rounds of sandwiches, knowing that there was a lot more high tea ahead of us! Next up were plain and raisin scones, which were brought to the table warm. They are served with seasonal homemade jams (we had a strawberry and a peach jam) and the most amazing and incredibly thick Cornish clotted cream. I mean, this cream could be cut with a knife. And it tasted more creamy and incredible than any other cream I’ve ever had. It is cream perfection; I can’t recommend it any more highly. Scones are followed by a selection of French-style cakes served on a tiered stand. Again these cakes do change seasonally. Being late summer when High Tea Society dined at The Dorchester, we enjoyed a selection which included a strawberry and lime tart, a crème brulée flavour mini éclair with apricot and a chocolate matcha cake. All were absolutely delicious. My only complaint was that there was only one of each for two people, so, if you’re like me and want to try a little of everything, you have to cut each tiny cake in half, which can be a tricky (and messy) business. Just when we thought we couldn’t possibly eat anything else, a choice of English style tea cakes, on a large silver platter, was brought around for us to select from. On the day we dined, the selection was a lemon drizzle cake and a layered chocolate velvet cake. The lemon drizzle actually went very well with a little of the remaining Cornish cream and the chocolate velvet was luscious and rich yet still very fluffy. Dietary requirements are happily accommodated and should be noted at booking. The selection of sandwiches available for vegetarians is particularly impressive. 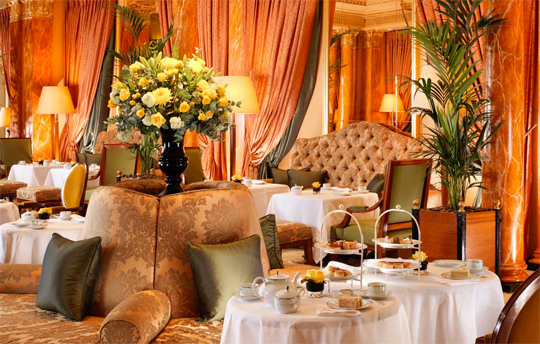 Having been serving high tea for over 80 years, The Dorchester certainly seems to know what it’s doing. 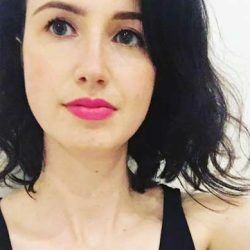 This high tea is a special experience, incredibly English, traditional and well worth it for Londoners and tourists alike. And, compared to booking a room for the night, it is also a much more cost-effective way to experience this famous hotel! 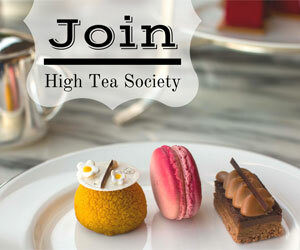 This high tea books out weeks in advance on weekends. A range of options from the Dom Pérignon high tea for £85, to the Traditional Afternoon Tea (reviewed here) for £49.